Steaks are the most popular cut of meat to cook on the grill. We've collected the best-ever ways to cook every kind of steak, in this round-up of delicious steak recipes. You'll find plenty of family-friendly dishes here, including budget-conscious recipes to help you stretch your food budget further. We've also included our favorite fancy steak recipes for romantic dinners at home, or to impress guests at dinner parties. Have you always wished you could make a steakhouse-style steak dinner at home? Now you can, with this genius recipe that walks you through each step of cooking a perfect restaurant steak in a cast-iron skillet, using just a few simple ingredients. Coat tender filet mignon steaks in a garlic-spiked herb mixture and marinate for a couple of hours before grilling. Using dried herbs in the marinade creates a fabulous crust on the meat, and makes for a simple preparation. Cook this Kentucky-style steak at your next cookout with friends and family, and prepare to receive rave reviews. Bathe flank steaks in an easy whiskey marinade up to 24 hours in advance, then butter-baste on a hot grill. Steak and blue cheese are a flavor match made in heaven. Strip steaks are used in this recipe, but you can substitute other cuts. The easy gorgonzola sauce is easy to make, can be prepared up to 3 days ahead, and adds fabulous, decadent flavor to skillet steaks. 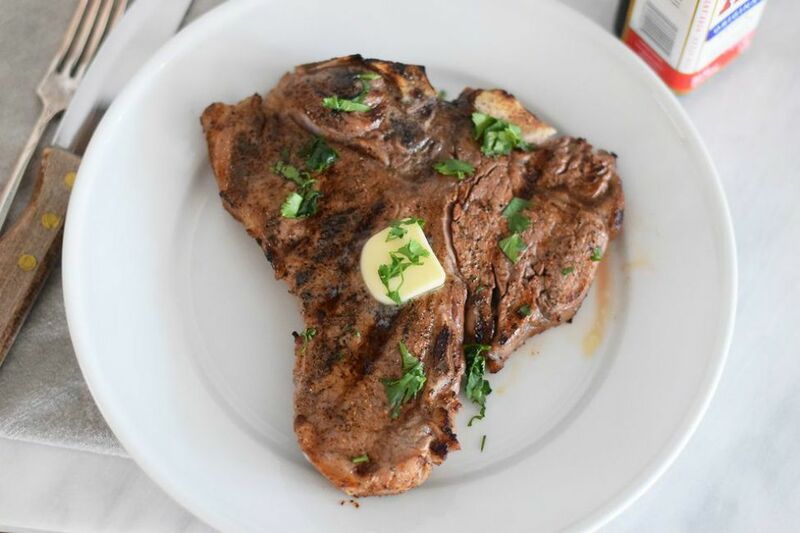 Get a reputation as a steakmaster with this foolproof recipe for perfectly grilled T-bone steak, topped with a simple, creamy mushroom sauce. Serve it with a side of mashed potatoes, plus some crusty bread for dipping. Stretch your dinner dollars with this quick and easy steak stir-fry recipe. Green and red bell pepper strips add bright flavor and crunch to a simple meal of pan-fried steak strips with fresh vegetables and Italian herbs. Steak au poivre ("pepper steak") is a classic French bistro dish that makes a show-stopping entrée for romantic dinners and special occasions. Crust a boneless steak with crack peppercorns, pan-fry, and serve with a rich cognac-infused pan sauce. Strip loin steaks are flavored with a simple compound butter (also called "hotel butter") featuring parsley and lemon juice, for this classic preparation. Grill the steaks outdoors, or use your oven's broiler. Serve with French fries or a baked potato, and a green salad. Drizzle budget-friendly flank steaks with lime juice, then rub with Mexican seasonings for a grilled meat dish that has your favorite taco flavorings cooked right in. Serve with rice and beans or Mexican street corn on the side. 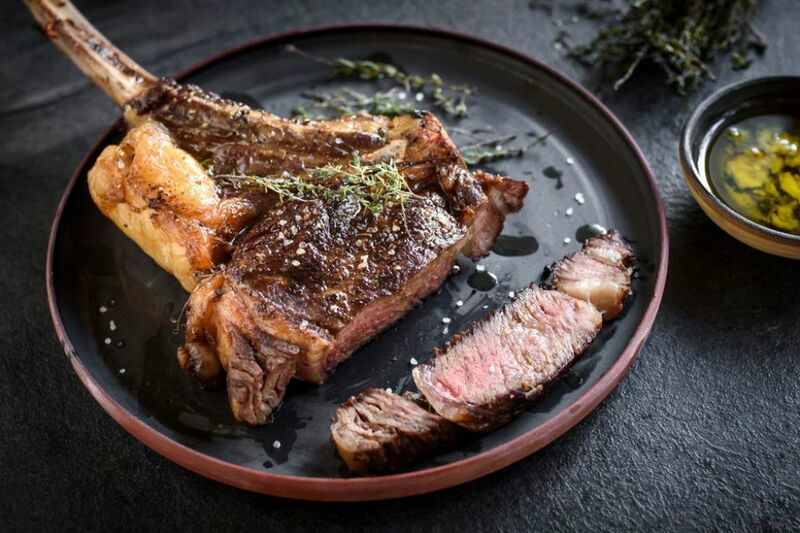 Enjoy the beloved Delmonico steak from Michael Jordan's famous Chicago restaurant without ever leaving home. Follow this recipe for a meaty grilled rib-eye with mushrooms, sun-dried tomatoes, rosemary, and an out-of-this-world steak sauce. Down-home chicken-fried steak with gravy is a popular, budget-friendly Southern recipe that is sure to become a favorite in your household. Tenderize top round steak, dip in buttermilk, bread, fry, and serve smothered in an easy milk gravy. Spicy Jamaican jerk seasoning boosts the naturally meaty flavor of flank steaks in this island-inspired recipe. Serve the steak sliced over rice, accompanied by a tropical fruit salsa, for a delicious Caribbean-style dinner. Carne asada is a traditional Columbian dish of marinated, char-grilled steak that's popular throughout Latin America. The marinade includes an entire bottle of beer, along with tangy citrus juice, garlic, Worcestershire sauce, and spices, for meat that explodes with flavor. Steak Diane is a classic, show-stopping restaurant recipe of tender filet mignon steak pan-fried in butter, and smothered in a rich mushroom cream sauce with herbs and brandy. Serve with mashed potatoes, and lightly steamed seasonal vegetables. What could make a meltingly tender, grilled filet mignon steak taste even better? Wrapping bacon around it, of course! Once you learn this simple trick, you'll want to try it out for all your special dinners at home, from hosting guests to romantic dinners for two. Rustle up a satisfying, Southwestern-style steak dinner with this savory recipe for grilled cowboy steak. Coat a porterhouse steak in a simple chipotle chili powder and garlic paste, then sear to perfection on a hot grill. Make steak night into taco night at your house, with this easy steak tacos. Toss meat in the fantastic, homemade Mexican marinade when you get home, and grill up a couple of hours later. Serve on warmed tortillas, with your favorite taco toppings. Tomahawk steaks are bone-in rib-eyes that are Frenched, giving the bone its distinctive "handle." This impressive-looking dish starts in a hot pan on your stovetop, and is finished in the oven for the perfect degree of doneness. Add butter and herbs just before serving for a final flavor boost. Imagine a classic Italian American chicken parmesan with steak instead of chicken, and you've got the idea for this dish, which uses economical top round steak. Top the breaded and fried meat with tomato sauce and parmesan cheese for a hearty twist on a favorite recipe. A crockpot makes easy work of this satisfying London broil recipe for your Sunday roast. Steak and veggies cook low and slow in a creamy tomato-mushroom sauce made with condensed soup and onion soup mix, for a flavorful meal that practically makes itself. Flavor boneless tri-tip steak (also known as bottom sirloin) with a simple garlic-soy marinade, before cooking easily on the grill. Serve with roast potatoes and a green vegetable for a complete weeknight meal. Marinate flavorful flat iron steaks simply in balsamic vinegar and seasonings, quickly grill, then slice into strips for your plate. Serve with roast potatoes or cooked white rice and a simple tossed salad, for a filling meal. A buttery bourbon, garlic, and mustard sauce adds gorgeous flavor to Southern-style pan-fried steaks in this mouth-watering recipe. A dash of Tabasco adds a nice kick to the sauce, but feel free to omit it if you like your meat less spicy. Asian flavorings infuse inexpensive, boneless round steak with tons of savory flavor in this recipe that's simple to prepare using a slow cooker. Let it cook while you go about your day, and serve it over hot cooked rice, garnished with optional diced scallions and sesame seeds. Marinate delicious, affordable flank steak in a tasty Moroccan-style marinade, grill quickly over high heat, and slice to serve with extra sauce poured over top. Serve over a bed of hot, fluffy rice pilaf, with pita wedges on the side if you like. Is it a steak dinner, or a main course salad? This yummy, healthy steak salad is both! It's budget-friendly as well, using a single steak for two satisfying, dinner-sized servings, with plenty of nutritious, dark leafy greens. Bring out the best in meaty, flavorful rib-eye steaks with this awesome recipe that shares three tested methods for grilling this well-marbled cut. Remove steaks from the fridge about 30 minutes before you plan to cook them for best results. Transform budget-friendly top round steaks into a Tuscan feast with this Italian-inspired, dinner party-worthy recipe. Marinate round steaks overnight in a sun-dried tomato, basil, garlic, olive oil, and red wine marinade, then grill and topped with extra sauce. Create a festive fajita bar for cookouts or family dinners with this easy steak fajitas recipe. Marinate flank steak in traditional seasonings overnight for flavorful meat that tastes fabulous. Grill and assembled in warm flour tortillas, with sauteed bell peppers, onion, and popular Tex-Mex toppings. You'll use this simple, flavor-enhancing steak rub recipe over and over again. It includes brown sugar and pantry spices like chili, cumin, paprika, garlic powder, salt and pepper. Pat steaks dry with a paper towel before applying the rub, for maximum adhesion and a good crust. Flash-marinate steak, onions, and bell peppers in a sweet and savory brown sugar, soy sauce, and ginger infusion. This combination delivers tons of flavor when the meat hits a hot grill. Serve these delicious kabobs at your next cookout, or for summer family dinner any night of the week. Fans of Indian curry can enjoy steak in a new way with this recipe that riffs on traditional Indian flavors. Marinate juicy chunks of steak overnight in a spicy seasoning mixture, then char-grill until tender. Serve over basmati rice.